Shoulder degenerative arthritis is a condition commonly developed in older people or those who have suffered an injury or trauma to the shoulder. The shoulder arthritis occurs in the acromioclavicular joint, the point where the clavicle and the acromion connect. When the joint is affected by arthritis, it loses its mobility, and it affects the person’s ability to perform the usual everyday activities. Unfortunately, the osteoarthritis often causes additional shoulder conditions such as bone spurs, shoulder instability, or labrum tears. The constant pain in the shoulder is the key symptom of the osteoarthritis. Even though the pain usually occurs while moving the arm and the shoulder, it can also occur during sleeping and resting, leading to sleepless and uncomfortably painful nights. When Michael Eavey visited Manhattan Orthopedic Care, he had been tortured by a severe shoulder pain for over six years. After the long period of limited mobility and painfully sleepless nights, Michael decides to put a stop on the agony and get the proper treatment for his shoulder. He met Dr. Armin Tehrany for a consultation, and he immediately felt that he came to the right shoulder doctor. Dr. Tehrany performed a thorough examination of Michael’s shoulders, and after he carefully analyzed the MRI Scans and the X-Rays, he discovered that Michael had a degenerative shoulder arthritis. Unfortunately, due to the shoulder arthritis, Michael had also suffered bone spurs, torn rotator cuffs, and labrum fraying. As an orthopedic surgeon who selflessly devotes his efforts, skills, and knowledge to providing the most comfortable and most suitable treatment for each patient, Dr. Tehrany recommended a surgical treatment for both shoulders that will address all issues at once. 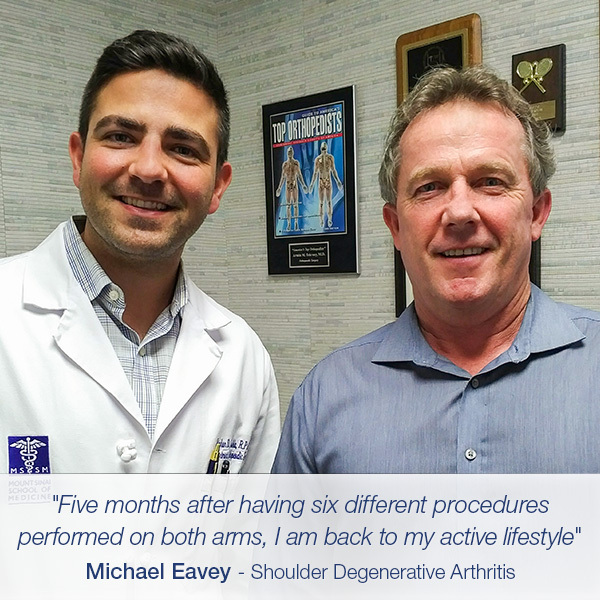 Instead of going through six different procedures for both his shoulders, Michael had one procedure that repaired his osteoarthritis, bone spurs, rotator cuff tears and the frying labrum. Moreover, during the surgery, Dr. Tehrany had even successfully treated Michael’s tendon inflammation. Thank you, Michael, for your trust and kind words.